This is a very unusual example of a Stromberg Self Winding Master Clock. It comes with the rare optional double jar temperature compensating mercury pendulum. The mercury is visible thru the two glass jars of the pendulum. 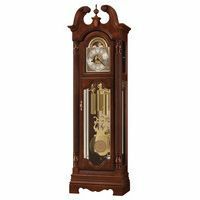 These clocks usually had the typical brass bob pendulum, both a much less expensive and sophisticated method.This clock is in excellent running condition, keeping perfect time. It will run when plugged into any standard USA household outlet (110v), because it has been fitted with a transformer-rectifier (not visible). 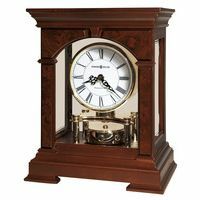 It will/could also power certain Stromberg slave clocks, as it was originally intended.The case is birch, with a dark walnut stain. It retains its original finish, although the varnish is a little dry in some areas on the sides of the case (mentioned for accuracy). The case is very large at 59.25 inches tall, 21.50 inches wide and 6.75 inches deep. It has a small round hole on the side, where once was a lock. This does not detract from the overall handsome looks and great presence of the clock. 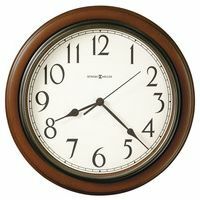 This clock, although a rare model, is similar in design to the more common Standard Electric master clock, E. Howard master clock and the Self Winding Clock Company master clocks, as well as others.